Today, ProPublica revealed the extent of problems at Sanitation Salvage, the largest private waste hauler in the Bronx. The revelations are a stark reminder of the need for fundamental reforms of the city’s commercial waste industry, through an exclusive commercial waste zone policy. The findings include fatal accidents, off-the-books workers, weak oversight, wage theft, racial harassment, and a sham union closely affiliated with management. Two deaths in six months: On November 7 2017, Mouctar Diallo, a 21-year-old immigrant from Guinea who was working on a Sanitation Salvage route, was killed under the wheels of the truck. For months his death was covered up. Then on April 27, the same driver ran over 72-year-old Leo Clarke as he was crossing a street. Safety violations: Records show that more than three-quarters of Sanitation Salvage trucks that receive federal safety checks are ordered off the road. Meanwhile the company has paid lobbyists to fight local legislation that backers say would compel haulers to improve on working conditions and safety. NYC’s Department of Sanitation is developing a zoning system that - done right - will bring much needed reforms to the industry. As DSNY puts it in the article: "A commercial waste zone plan will provide inherent safety benefits to pedestrians, the public and workers. With fewer trucks on the streets and shorter routes, zoned collection will also mean less unsafe driving behavior and worker fatigue, and improved traffic and air quality." Long hours and dismal pay: Off-the-books helpers at Sanitation Salvage make $80 a night at most, whether their shifts take 12 hours or 20. Wielding political connections to fight change: The family that owns Sanitation Salvage, the Squitieris, have been fighting reforms tooth and nail through their deep political ties and donations. 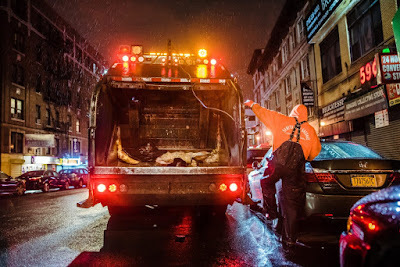 The night-time collection of commercial waste in New York City continues to be like the Wild West in comparison to the day-time pick-up of residential waste by DSNY, in which trucks drive efficient, safe routes and workers are paid well and treated with respect. Hell on Wheels makes it clear that piecemeal, industry-led reforms will never bring the change that’s urgently needed throughout this industry. New York City needs a strong, exclusive waste zone system now.